Do you know the difference between un and l’un? If you answered, "Huh? Why would you ever put the definite article l’ in front of un?" then this is the lesson for you. There are two reasons to use l’ in front of un: one has to do with register, the other with euphony. When un is an article or a number, it’s always un: it cannot be replaced with l’un. So how do you know which role it’s playing? If un is followed by a noun, it’s either a number or an article. If it’s followed by anything else, such as the preposition de, it’s a pronoun, and may potentially be replaced with l’un. Once you’ve determined that un is a pronoun, there are two reasons you might want to change it to l’un. 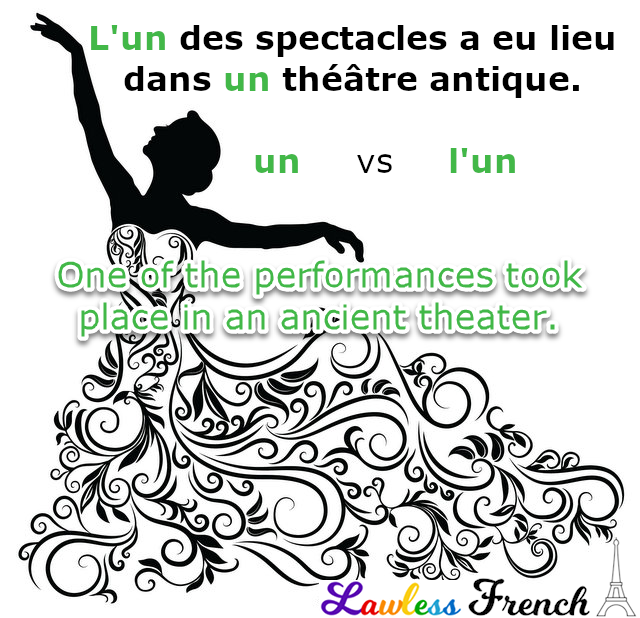 L’un is more formal than un, so using it makes your French sound more elegant. Vous devrez passer l’un de nos examens. You’ll have to take one of our tests. J’espère assister à l’une de vos conférences. I hope to attend one of your conferences. L’un de mes enfants est en retard. One of my kids is late. Oh là là, l’une d’entre elles a manqué le bus. Oh dear, one of them missed the bus. Les uns parlent, les autres écoutent. Some talk, others listen. In fixed expressions, l’un is required. Elsewhere, it’s optional – you can decide whether to use it to make your French more formal or euphonic. Incidentally, l’Un is the French equivalent of "The One" from the philosophical discipline of henology. Next Oh là là !